(i) The primary and secondary windings have zero resistance. It means that there is no ohmic power loss and no resistive voltage drop in the ideal transformer. 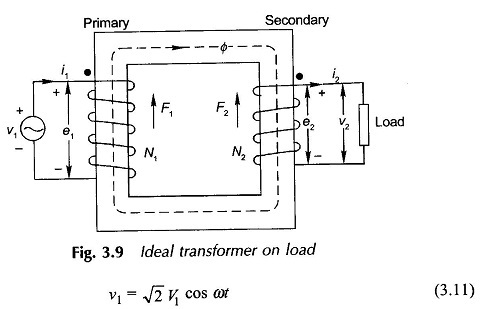 An actual transformer has finite but small winding resistances. It will also be assumed that there is no stray capacitance, though the actual transformer has inter-turn capacitance and capacitance between turns and ground but their effect is negligible at 50 Hz. (ii) There is no leakage flux so that all the flux is confined to the core and links both the windings. An actual transformer does have a small amount of leakage flux which can be accounted for in detailed analysis by appropriate circuit modelling. (iii) The core has infinite permeability so that zero magnetizing current is needed to establish the requisite amount of flux (Eq. (3.6)) in the core. (iv) The core-loss (hysteresis as well as eddy-current loss) is considered zero. which means that the instantaneous power into primary equals the instantaneous power out of secondary, a direct consequence of the assumption (i) which means a loss-less transformer. i.e. the VA output is balanced by the VA input. It is concluded from Eq. (3.25) that the impedance on the secondary side when seen (referred to) on the primary side is transformed in the direct ratio of square of turns. Transferring an impedance from one side of a transformer to the other is known as referring the impedance to the other side. Voltages and currents on one side have their counterpart on the other side as per Eqs (3.23(a) and (b)). In conclusion it may be said that in an ideal transformer voltages are transformed in the direct ratio of turns, currents in the inverse ratio and impedances in the direct ratio squared; while power and VA remain unaltered. 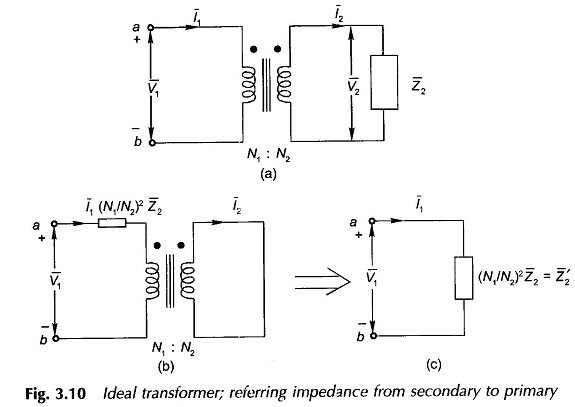 Equation (3.25) illustrates the impedance-modifying property of the transformer which can be exploited for matching a fixed impedance to the source for purposes of maximum power transfer by interposing a transformer of a suitable turn-ratio between the two.